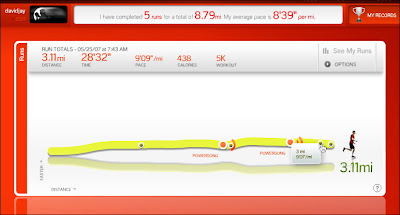 I slowed the pace down a bit but my average is still pretty good. Ya see I'm not much of a distance runner but I will beat everyone in the 50 yard dash. Long distance running actually trains you to be slow so that's why I never did it. Athletes need bursts of speed not a long consistent jog so we did more training like that and the longest run we had to do was a 2 mile run in under 12 minutes. The only worse run was when me and the other freshman didn't do our job of cleaning up the gear one day after practice so the upper classmen grabbed us and put us in their trucks and took us to Coyote Road which is a long windy road going straight up the mountain. They let us keep our shoes on but then stripped us to our underwear and made us run up the hill while they threw things at us from their cars. We did a better job with the gear after that. That's good my friend... but still 3 mins off from my best 5K. I guess my shoes are right... "Faster Than You"
David do you have an 800 number for showitweb support? Richard - hitup http://showitfast.com/support if you need help and they'll get back to you asap. Now that's motivation! Brett - let's make a bet with the ladies! DJ, congrats man, lets run next tuesday if your in town! David, where did you find the Nike+ widget/badge thingy that is on your blog? I can't find it fot he life of me! Thanks man, keep up the good work!